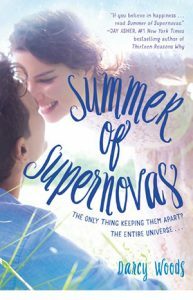 All this talk of the sun and moon this week has the Sweethearts feeling swoony and starry-eyed, so for our August contest, we are giving away a copy of SUMMER OF SUPERNOVAS, the (two time!) RITA-nominated YA romance by Darcy Woods. We’re also switching things up a bit and running this giveaway through our Instagram account. So make sure you’re following us on Instagram and head on over to our contest post to read all the rules and enter!